Culms: Erect, stiff, strongly triangular, usually rough on angles, purplish-red at base. Leaves: Flat, to 1/5 inch wide, prominent mid-vein, rough near tip, margins rolled under near tip. Sheaths: Dark red, composed of numerous fine fibers. Inflorescences: Spikes, unisexual; upper 1-3 spikes staminate, erect, long-stalked; terminal spike 1 to 2 inches long, subtended by 1-2 shorter, sessile spikes; lowest leafy bract surpassing staminate spikes; staminate scales pointed, reddish-brown; lowest 2-3 spikes pistillate, sometimes with few staminate flowers at tip, erect, .4 to 1.6 inch long, sessile or lowest on slender stalk; pistillate scales broadly lanceolate, gradually tapering to point or awned, reddish-brown or purplish, green center, as long or longer and usually narrower than perigynia; perigynia to 75 per spike, nearly circular, to 1/5 inch long, densely woolly-hairy, many-ribbed; beak 2-toothed. 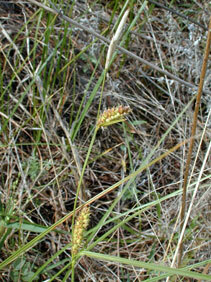 Flowers: Achene, triangular in cross-section, yellowish-brown, dotted, 1-seeded; stigmas 3. Habitat: Marshy areas, swamps, wet prairies and meadows; sometimes in shallow water.